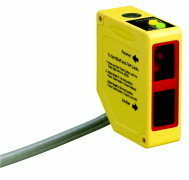 Our company is engaged in offering a comprehensive range of Automation Sensors. 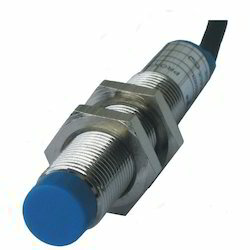 We offer a wide range of Sensors such as World-Beam Q12 Series, T8 Series Sensors, M12 Series Visible Red LED Sensors, VS2 Series Sensors, VSM Series Sensors, SB12 Series Sensors and many more items. 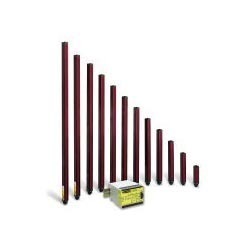 We bring forth a comprehensive range of World-Beam Q12 Series. 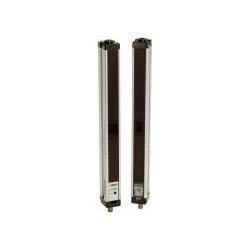 These are ideal to be used for ultra-miniature photoelectric sensors. 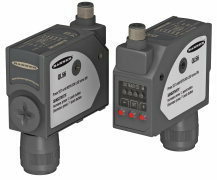 Our series features a housing just 22 by 8 by 12 mm, with bipolar NPN/PNP outputs, Available in opposed, fixed-field, and polarized and non-polarized retro reflective sensing modes , Delivers powerful sensing performance in extremely confined areas, Rated IP67 for use in the widest range of locations and applications, Available in models with rugged, sealed housing or PFA chemical-resistant jacket , Mounts directly on or inside manufacturing equipment, with robust metal-lined mounting holes consistently located on all models , Uses unique overmolded design for enhanced durability and shielding , Available in dark- or light-operate models. 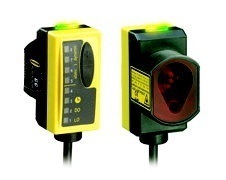 We bring forth a comprehensive range of M12 Series Visible Red LED Sensors. 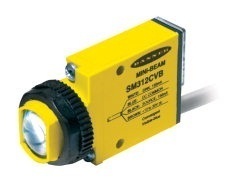 These products features compact 12 mm threaded metal barrel, Available in opposed, polarized and non-polarized retroreflective, diffuse and fixed-field modes, Provides single-turn sensitivity adjustment on opposed, retroreflective and diffuse models, Features fixed-field models with excellent background suppression and recessed mounting, Provides visible red sensing beam for easy alignment, Offers 10 to 30V dc supply voltage with NPN or PNP output, depending on model, Completely encapsulated electronics to provide superior durability, even in harsh sensing environments—rated IP67, Includes two signal indicator LEDs for easy operating status monitoring from any direction. 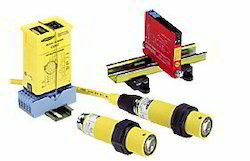 We bring forth a comprehensive range of world beam qs18 series sensors. 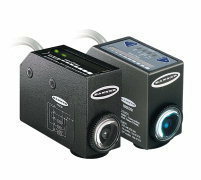 these features a universal housing with an 18 mm threaded lens or side mounts, replaces hundreds of other sensors, meets ip67 and nema 6 standards for harsh environments, available in opposed, polarized and non-polarized retro reflective, convergent, regular and wide-angle diffuse, laser, ultrasonic, plastic or glass fiber optic, fixed-field and adjustable-field sensing modes, offers easy push-button teach-mode setup in expert qs18e and ultrasonic models, ranges up to 20 m, features bright led operating status indicators visible from 360°. 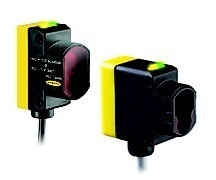 Our company is engaged in offering a comprehensive range of World Beam Q20 Series Sensors. 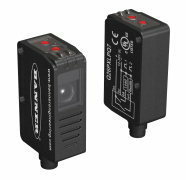 These are available in opposed, polarized and non-polarized retroreflective, and diffuse models, Offers visible red beam for easy alignment on most models, Features bright LED status indicators visible from 360°, Provides water-tight, IP67 and NEMA 6 rated enclosure for rugged, reliable sensing, Rated to 1200 psi for washdown environments, Offers 10 to 30V dc supply voltage with complementary NPN or PNP outputs, depending on model, Provides versatile mounting options, including M3 (3 mm) threaded inserts with 25.4 mm hole spacing, Includes single-turn gain potentiometer for easy configuration, depending on model type. 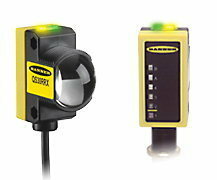 We bring forth a comprehensive range of Q26 Series Clear Object Sensor. These are featured with a Clear, transparent objects reliably detected, Polarized retro coaxial optical design enables detection of mirror-like surfaces; allows sensor and reflector to operate at very short distances; enables very precise leading edge detection, LO/DO switch, single turn sensitivity potentiometer, compact housing, Quick and easy adjustment of sensitivity with single-turn potentiometer, Compact housing fits in tight locations and 20mm mounting hole spacing enables quick mechanical installation. 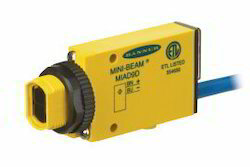 Our company is engaged in offering a comprehensive range of Mini- Beam Series Sensors. 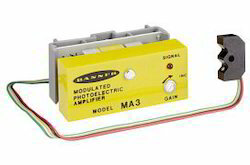 These are featured with extensive family in all sensing modes and ranges to 30 m, Models for ac, dc, or ac/dc universal voltage operation, Infrared or visible red, green, blue or white sensing beam, Easy push-button TEACH-mode setup in Expert SM312E models, MIAD9 series NAMUR models for hazardous environments with approved switching amplifiers with intrinsically safe input circuits, MINI-BEAM models for clear plastic detection; MINI-BEAM Expert models for clear object detection. 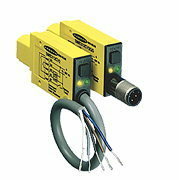 We bring forth a comprehensive range of World- Beam Qs30 Series Sensors. These are offered inInnovative 30 mm housing design to suit almost any mounting requirement, High-power sensing with ranges up to 200 m, Available in opposed, high-power opposed, polarized and non-polarized retro-reflective, diffuse, laser, and fixed-field and adjustable-field sensing modes , Class 1 visible laser in diffuse and retro-reflective models and Class 2 in diffuse models, Models with standard 10 to 30V dc supply, voltage and bipolar NPN/PNP outputs or 24 to 250V ac/12 to 250V ac supply voltage with e/m relay output, Light- or dark-operate selectable or configurable, depending on model, IP67 or IP69K environmental rating, depending on model, Bright LED operating status indicators visible from 360°. Plastic fibers are inexpensive and easily cut to length during installation. Plastic fibers bend easily to fit precisely where you want them. 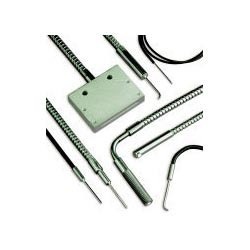 High-flex models withstand repeated flexing and bending. Special jackets withstand corrosion, impact and abrasion. Coiled versions are available for applications requiring articulated or reciprocating motion. Fibers are available in individual or bifurcated styles for opposed or diffuse sensing. Diameters include 0.25, 0.5, 0.75, 1.0 and 1.5 mm. Custom-designed fibers are quickly built for your unique applications. 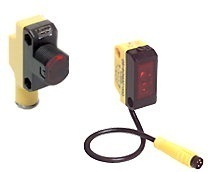 Extremely rugged and powerful opposed-mode intrinsically safe barrel sensors are designed for the most demanding hazardous area sensing applications. 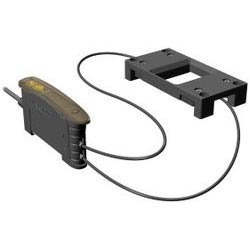 Sensor is certified as intrinsically safe for use in all hazardous atmospheres as defined by Article 500 of the National Electrical Code, when used with approved "positive input" intrinsic safety barriers. 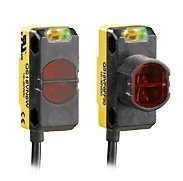 Sensor is certified by Factory Mutual and CSA as non-incendive devices when used in Division 2 locations (except Groups E and F) without intrinsic safety barriers. 10 millisecond sensor pairs have a 140 m range; 1 millisecond pairs have a 60 m range. Modulation frequency "A" is standard; frequencies "B" and "C" are also available to minimize optical crosstalk from adjacent sensor pairs. Device Net is a trademark of the Open Device Net Vendor Association, Inc. 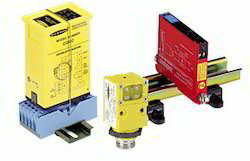 Looking for Automation Sensors ?